The National Trails System Act of 1968 established two national scenic trails, the Appalachian (AT) and the Pacific Crest (PCT) and called for studies of 14 other routes. Since that time eight National Scenic Trails (NSTs) have been officially designated (most recently through enactment of the 2008 National Trails System Act), including the North Country National Scenic Trail (NCT). Presently, of the eight, only those originally designated, the AT and the PCT, are anywhere near completion. The NCT has a long and winding history. No one really knows who dreamed up the idea. Seems the earliest anything appears in writing, at least as can be found, is 1965--as documented in The Early History of the North Country Trail. Those concepts show varying distances for the trail, around 3,000 miles, give or take. Even as recently as 2008, in that act, the NCT is described as being “…a trail of approximately thirty-two hundred miles.” What the final distance might end up being (as it continues growing in leaps and bounds with each passing year) is anybody’s guess. When the dust finally (and literally) settles, it’ll probably extend for a staggering 4,600 miles or more. To date, 1,800 miles of tread meet required standards and have been “certified off-road.” What this means is that less than half the trail is (currently) forevermore protected. The remaining miles, around 2,800, share treadway with other users, with a fair number ending up on county back roads, and state and federal highways. And so, onto this trail will the old Nimblewill Nomad venture. Odyssey 2009 began on March 22, in North Dakota on the banks of the Missouri River at the Knife River Indian Villages NHS, one of the most significant of sites along the Lewis and Clark National Historic Trail in North Dakota. From there he’ll hike the short distance north to Lake Sakakawea State Park, the official beginning/terminus of the NCT. And why would Nimblewill want to trek the NCT you might ask? Well, seems Nomad’s ultimate quest, before heading on up that final treadway in the sky, is to hike all eight NSTs. 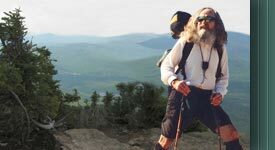 Of the eight, he’s hiked all but two, those being the NCT and the Ice Age National Scenic Trail. So he’s decided that 2009 is the year to take on the NCT, good Lord willin’ the old fellow is now 70. The NCT will present great challenges for Nimblewill. Being such a very long trail as it is, around 4,600 miles, and being primarily latitude-oriented along the northern tier of states, successfully thru-hiking the NCT will require both great endurance, as to continual long-mileage days, and in addition, the likely need to withstand harsh, winter-like conditions, no doubt on both ends of the journey. So, now an invitation from Nimblewill Nomad, to all dear friends--to follow along as journals, video/audio segments and photo albums are posted. Also, and if you would, please keep him in your prayers for a safe and successful conclusion to this latest great adventure.